If you are a speaker (like me) and want to get more speaking events, this is the post for you! Today we will cover a bunch of different speaker marketing topics and have a little resource at the end! You would be amazed how many people I talk to who say they are speakers but who never actually speak. I am not sure if they are just unsure of what to do to get started or have fear that they won’t be good enough or maybe just don’t have a plan for their speaking, but that all ends today! Okay, first off let’s talk about what counts as a “speaking” event today! I am by no means an “A” level speaker but I have been the opening speaker at national conventions and have spoken extensively over the years. This year one of my goals is to get more opportunities to speak so I am thrilled that a reader, Pat of Smarter Women Colorado, asked for this post and worksheet! The easiest way is to tell everyone you know that you are speaker. Do this after every speaking event or anytime you get a chance to introduce yourself. Email your list and let them know you are looking for speaking events. Your current fans could be a great source for leads! Social Media…include it on all of your social media profiles, in your descriptions and as a separate job in LinkedIn. Post your availability on Facebook at least every other week. Have a speaker page on your website. 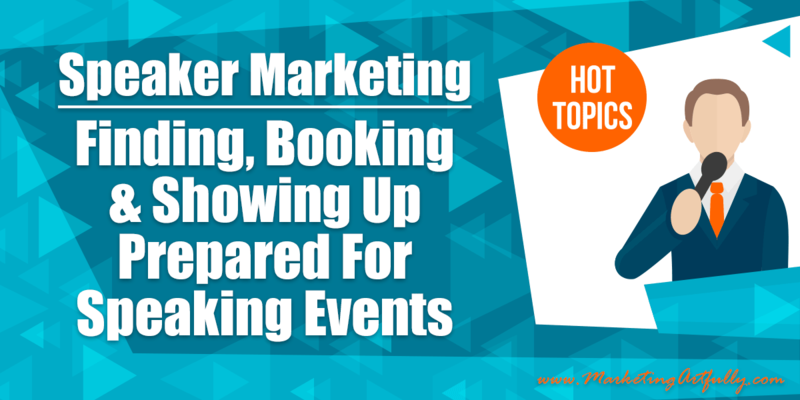 I rank #1 for Denver Marketing Speaker which gets me gigs just because it is sitting there! Offer to speak on podcasts. This is a super hot new area for speaking events…the beauty is that you can do it from your home without all that travel! Call every service club in the area and ask if they need speakers for their events! Once you have gotten the call, you need to be super organized to get the gig! Event organizers are looking at you from the moment they first find you so making a great impression is super important. You will need to have some kind of “media kit” that will include all the details the organizer will ask for! 1. A fact sheet. The fact sheet is a one page document with bullet points about what makes you amazing and different. 2. Biography. A strong biography is another important ingredient of your media kit. Limit this also to one page and list only your most interesting highlights. 3. High resolution professional photo of yourself. (also known as a “headshot”). 4. Web Links. Your site and also any links to any social media presence that your company/project may have (like Facebook, LinkedIn, Pinterest, Instagram, or Twitter). Also include links to your work (audio, video, images or texts). 5. Web-Ready Graphics and Banners. Include any graphic you might have that would be relevant to a great story about you or your business. 6. Endorsements. If you’ve been mentioned on popular websites or blogs, share that. Include any awards you’ve received. Have you worked with recognized names? If you have raving fans include links to their video testimonials. 7. Contact Details. It is important to include your complete contact information, and especially, make sure they can email you directly from your media kit. The more convenient you make it for them to easily connect with you, the more likely that they will. 1. Powerpoint – most big venues require all of the speakers to submit a powerpoint. Believe me, if I can avoid it I do, but generally it is a “must have” item. 2. Printed Materials – I LOVE having printed materials instead of a Powerpoint. First off, they never “don’t work” like the projector sometimes does and second they give you and opportunity to leave something with your audience that they can refer back to! 3. 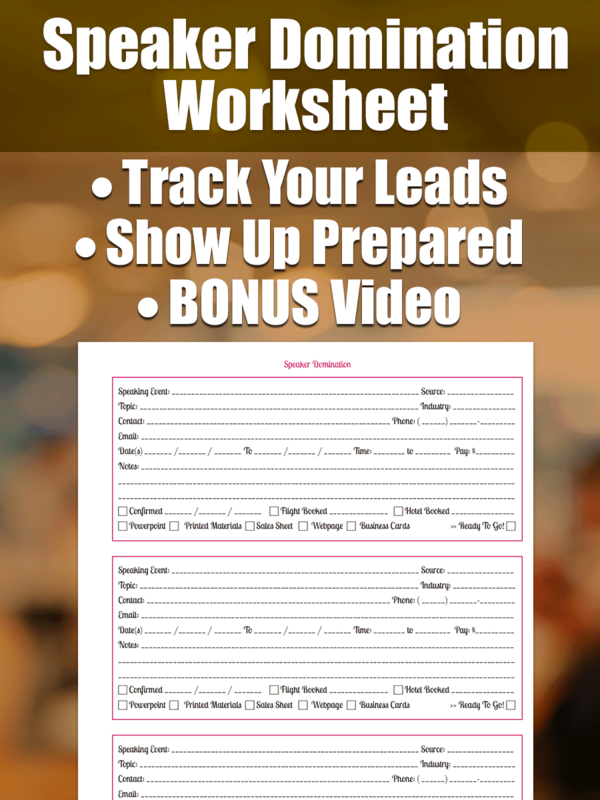 Sales Sheet – Sometimes you can have an offer to give to your listeners. If it is not okay, then don’t do it, but if you are doing a free talk or the organizer allows it, then sell away! 4. Webpage – It is always great to have a custom page made for your listeners that lists all the resources you talked about, maybe a free offer to get them to sign up for your list and even your sales offer. Make it easy to remember using a custom domain name like tarajacobsennotes.com or even use the Pretty Links plugin to make a shortened version like marketingartfully.com/spp. 5. Business Cards – Yep, they still work and people will ask for them. I like to make custom cards if I am speaking at a big event but either way, make sure to have your contact information on them and a reason to call you!